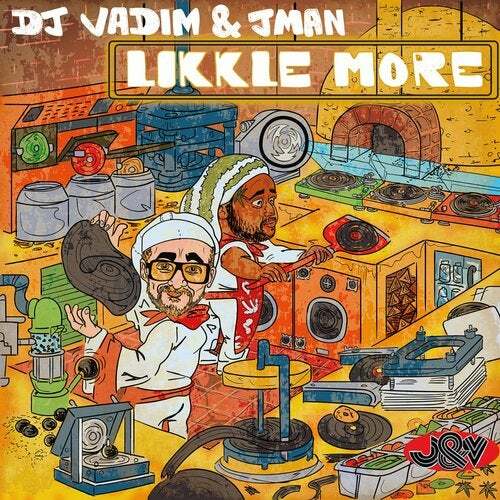 Seizing on the success and popularity of their previous collaborations including three tracks on Vadim's Dubcatcher vol 3, Likkle More feels like the natural progression for two artists who have worked and travelled the world together. The title is a Jamaican slang for I'Ll see you later(Mi see yuh Likkle more) which is quite apt because this album feels like a journey beginning, something to which one will come back to. It is also music that challenges, music for change, turbulent times, for revolution, for standing Upright whilst remembering Everything's bless. Working under the title J&V, the duo have been in the studio to focus their combined talents into one solid project, which acts as the perfect showcase for their respective skills on the mic and behind the boards. The Legendary DJ Vadim, sound design mastermind who's been slaying turntables for the last two decades. Being a student of the Reggae/Hip hop sound, he has deep understanding for the culture and its roots, giving him a fine ear for creating his own original riddims wether they're for Reggae & Dancehall legends Max Romeo & TOK from Jamaica, Fat Freddys Drop in New Zealand to UK/US Hip hop royalty Dilated People's & KRS 1 just to name a few. Then we have Jman, recognised as one of the most dexterous and adaptable MC's to come out of the UK, in terms of his lyricism and wordplay, as well as his ability to flow on almost any genre and style, from his infamous hip hop alias Babylon dead to devouring Grime raves, Reggae dances, Jazz band jams, Jungle sessions and beyond. After being signed to Greasy vinyl at the tender age of 17, Jman released two solo albums before he went on to work & collaborate with an array of talent such as Rag'n'Bone man, Mungo's Hifi, High focus, The Mouse outfit & Dub phizix. The result of this union is a brilliantly constructed album that fuses elements of Reggae, Jazz, Dub, Hip hop and Jungle into perfection. The two main players are joined along the way by various supporting stars including amazing features from the likes of Jamaican ragga lagend Daddy Freddy, Upcoming singjay and Jamaican soap opera star Shanty B, Spanish co-horts Lasai from legal shot soundsystem, OBF soundsystem host Sr. WIlson and award winning multi genre vocalist Maddy. Likkle More is set for a summer release where it will provide the ideal soundtrack for those warm days and balmy nights. Stay tuned !